Uses Xbox controller prompts for keyboard and mouse. In-game mouse movement depends on the framerate and is very jerky even at 60 FPS. It gets smooth when the game runs at around 100 FPS or higher. 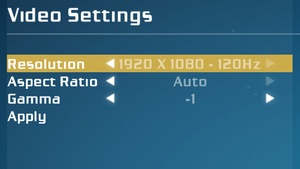 HUD elements, in-game text and button prompts don't scale up and are very small at 4K resolutions. Open %LOCALAPPDATA%\BC\data\settings\renderer_settings.xml with a text editor. 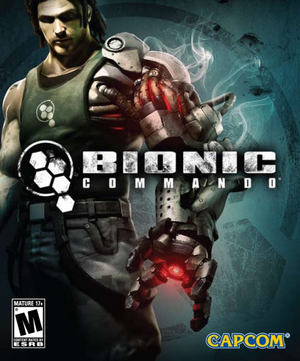 Change windowed = "false" to windowed = "true"
Search for Bionic Commando in the profiles list. Set Antialiasing compatibility to 0x004010C1. Set Antialiasing - Mode to Override any application setting. Set Antialiasing - Setting to 2x/4x/8x Multisampling. 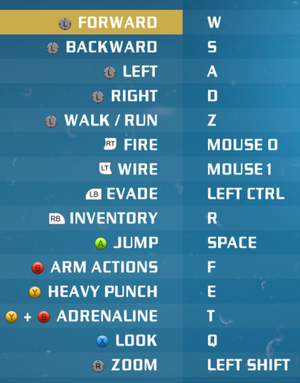 Don't Alt+Tab ↹ out of the game without opening a menu first, otherwise the lighting will be messed up. Morphological filtering (MLAA) can be forced in the graphics card control panel (AMD). Input device is selected by pressing either ↵ Enter or Start button at the start screen, which disables the other device from that point on. Since you can't have multiple secondary weapons at the same time only one key is needed. ↑ 2.0 2.1 File/folder structure within this directory reflects the path(s) listed for Windows and/or Steam game data (use Wine regedit to access Windows registry paths). Games with Steam Cloud support may store data in ~/.steam/steam/userdata/<user-id>/21670/ in addition to or instead of this directory. The app ID (21670) may differ in some cases. Treat backslashes as forward slashes. See the glossary page for details. This page was last edited on 13 October 2018, at 11:56.